Epithelial to mesenchymal transition (EMT) is the process whereby epithelial cells are transformed into mesenchymal cells. Epithelial cells form the epithelium tissue which covers the internal and external body surface of an organism. These cells are polarized and form extensive cell-cell adhesions, including adherens junctions and tight junctions, with each other . One of the fundamental functions of epithelial tissue is to act as a protective barrier for the underlying tissue and organs. Mesenchymal cells are, however, not well organized in a three-dimensional extracellular matrix . During development, mesenchymal cells can gain the ability to migrate and differentiate into other cell types. This gives rise to the formation of defined structures, such as the neural crest . type 3 EMT is associated with tumor metastasis . Here we will only consider the EMT in development where it plays important roles in producing the various tissues and organs, and defining their arrangement in the body. Stiff matrix promotes integrin clustering which promotes the recruitment of Rac1b to the membrane, facilitating its interaction with NADPH oxidase and the subsequent production of ROCs which promote Snail expression and hence EMT. On the other hand, Rac1b is less likely to be recruited to the membrane of cells in a softer matrix. EMT is less likely to occur in this situation. Importantly, EMT is reversible, meaning a mesenchymal to epithelial transition, (MET) can occur. In fact, several cycles of EMT and MET are required before the final architecture of the organ is established. These rounds of EMT are known as primary, secondary and tertiary EMT . An example of primary EMT occurs during gastrulation, where embryonic epithelium undergoes EMT to form the mesoderm. In vertebrates, gastrulation is induced by proteins from the transforming growth factor β (TGFβ) superfamily, especially Nodal and Vg1 . These TGFβ proteins, together with the aid of fibroblast growth factor (FGFs) signaling, induce the Snail gene , which is a key transcription factor for EMT . Snail promotes the breaking away of the epithelial cells from the basal membrane prior to their EMT, by repressing E-cadherin expression  and activating metalloproteinases . This cleaves the cell adhesion complexes and degrades extracellular matrix, respectively, to aid cell migration . Nodal and Vg1 also promotes Wnt signalling , which co-operates with FGF and Snail to orchestrate EMT . The molecular mechanisms that drive EMT are complex and involve many more biochemical components. These have been reviewed extensively in . In addition to the biochemical signals, mechanical signals, such as the rigidity of the cell’s microenvironment, also play roles in the regulation of EMT. Lee et al. observed that mammary epithelial cells underwent EMT when placed on hard substrates and treated with matrix metalloproteinase-3 (MMP3). This was not observed in cells grown on soft substrates . Furthermore, treatment with MMP3, caused cells on both substrates to increase their expression of Rac1b. However, only those cells on the hard substrate produced reactive oxygen species (ROS)  which is downstream of MMP3 and Rac1b . Interestingly, in cells on hard substrates, Rac1b is recruited to the cell membrane through integrin clustering. This allows Rac1b to assemble with NADPH oxidase and contribute to ROS production. It was determined therefore, that cells growing on rigid substrates will undergo EMT after the expression of Snail is increased following Rac1b mediated ROS stimulation . Stiffer substrates have been shown to promote integrin clustering  and focal adhesion formation , and it is this process that leads to Rac1b recruitment and its interaction with NADPH oxidase that produces ROS, which in turn promotes EMT. As soft substrates do not promote integrin clustering, this cascade of events does not occur, and cells growing on soft substrates do not undergo EMT. 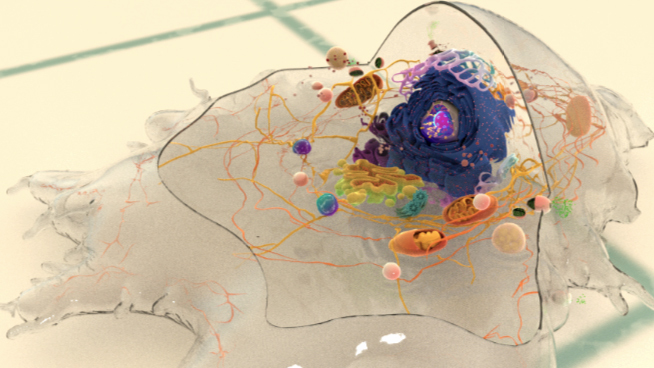 Besides the rigidity of the cell microenvironment, other mechanical stresses placed on epithelial cells from their neighbouring cells, are implicated in the initiation of EMT. This was described by Gomez et al. who used microfabrication techniques to generate a confluent, square-shaped sheet of mammary epithelial cells. After treating them with TGFβ (an inducer of EMT), the team observed that the cells underwent EMT preferentially at the corner and edge of the square, which correspond to regions of higher mechanical stress . High levels of myocardin-related transcription factors A (MRTFA) was also found to be localized in the nucleus of cells located at regions of higher mechanical strain . When mechanical strain is lower, MRTFA binds to actin monomers and is retained in the cytoplasm . However, when mechanical stress increases, the tension of cytoskeleton increases and this activates the Rho-actin signaling pathway, which reduces the amount of monomeric actin in the cytoplasm, causing MRTFA to translocate to the nucleus . Here, MRTFA forms a complex with Smad3, which binds to the promoter region of the SNAI2 gene, activating its transcription and subsequently dissolving cell-cell contacts . MRTFA is a co-activator of serum response factor (SRF) which upregulates actin cytoskeletal proteins leading to cytoskeleton remodelling . 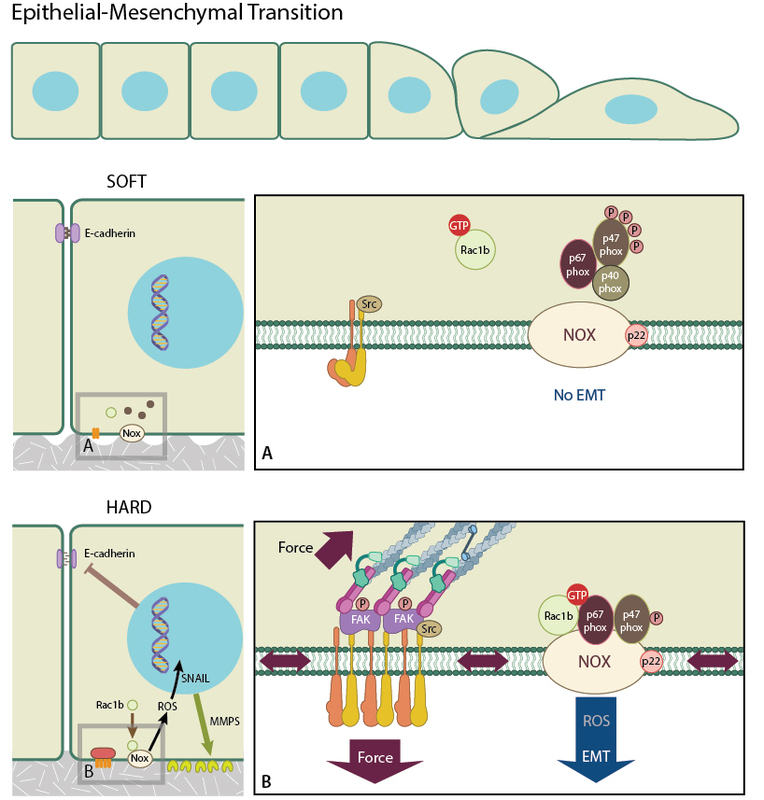 This dual pathway is activated following the nuclear localization of MRTFA, and promotes epithelial cells to undergo EMT. The direct application of biomechanical force has also been found to be sufficient to induce EMT. Zhou et al. stretched human keratinocytes by applying a 10% elongation to these cells, and observed that the applied force can directly activate NF-κB, which in turn promotes EMT . Similarly, the application of compressive force to HEK-293 cells was shown to induce the expression of EMT regulators SNAI2 and ZEB1, along with the messenchymal marker VIM, via the RhoA/ROCK pathway . Taken together, these experimental results highlight that underlying EMT is a complex network of signalling that involves not only biochemical signals, but also a variety of mechanical cues.